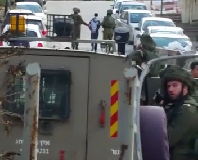 The past two weeks in Sheikh Jarrah have seen a resurgence of settler harassment and violence against the local Palestinians – beyond low intensity abuse that is the norm. Verbal sparring and abusive exchanges were sparked when a young settler entered the occupied Al-Ghawe house on August 16th. The teenager then went to the top of house and hoisted a huge Israeli flag up on the roof, next to the oversized menorah, a deliberate act of provocation intended to insult the evicted Palestinian family further. After more shouting from both sides in Hebrew and Arabic, the Israeli settler picked up a very large rock and started threatening to throw it at people. Four of five community members rushed towards him and managed to take the rock away and restrain him. The settler called police, told them a warped version of events, and the usual outcome consequently occurred – one of the shebab was arrested. After another scuffle between a large group of settlers and local Palestinians, police were again called by the settlers and, as usual, they arrested only a Palestinian and no Israelis despite fact that they had initiated the violence. 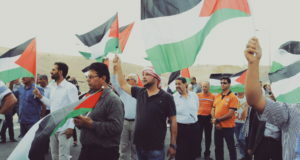 Ayman Al Ghawe was kept in jail for one week, accused of assaulting three settlers, even though there was no evidence of this and in fact it was him who was left bleeding at the time of his arrest. Police have also been trying to arrest an eleven year old boy from the area who settlers claim threw glass at “their” house – the house belonging the the Al Ghawe family which they have occupied since August 2nd 2009. He was summoned to a Jerusalem police station but did not attend. 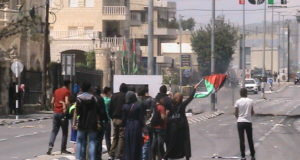 On August 22nd at about 7AM, another Sheikh Jarrah resident called Jad had the tyres on his vehicle slashed. Although there were no witnesses to the attack, the Palestinians strongly suspect that settler youth were behind the attack because many similar incidents have occurred in the past. The van was used in the course of his work, transporting disabled people. Following this vandalism, ISM volunteers hopefully suggested that the Israeli company which employs him mighty cover the cost of the repair, since he had been the victim of a racist attack. However, the opposite happened. The Israeli company said that they were concerned the vehicle might be set on fire next time – they took the view that Jad’s vulnerability as an inhabitant of a neighbourhood frequently subjected to attacks from settlers made him a liability, and he was fired from his job.